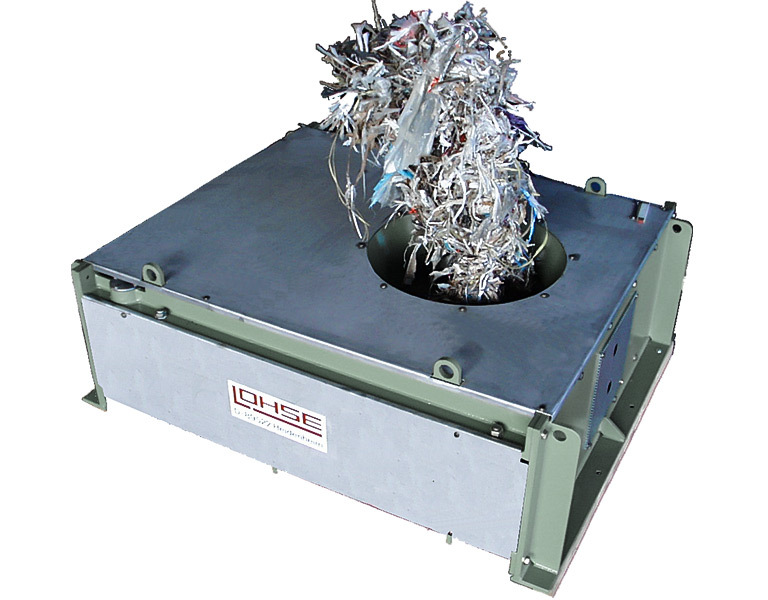 The suspension that rotates on the pulping process in the waste paper pulper spins the contrary material that came in with the waste paper, such as, e.g. wires, films, plastic and insoluble paper, into a rope. This rope is drawn out of the waste paper pulper with a rope winch. The rope winch is driven with a suitably variable interval switching. Depending on the amount of contrary material in the waste paper to be processed, and on the size of the pulper, endless ropes with a diameter of between 150 mm and 500 mm are formed. For disposal purposes these ropes must be cut into transportable pieces. This is done with a Lohse rope cutter, which is installed behind the rope winch in such way that the rope emerging from the winch is led without force via a funnel into the cutting opening. Lengths very between 300 mm and 3000 mm, depending on customers‘ wishes. The rope cutter consists of two cutter bars with four integrated reversing scissor blades, which are moved in the opposite direction to the middle of the scissors by means of a hydraulic cylinder. The rope is cut through without interrupting production and without an increased risk of accident. cutting time: ca. 130 sec.